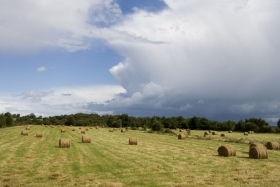 A county with more than 125,000 cows, Longford typifies the Irish Midlands with its low-lying bogs and pastures. 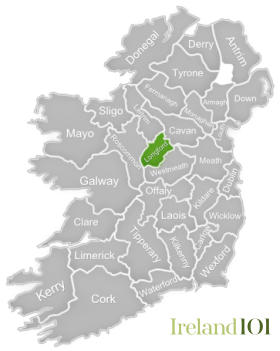 It is hemmed in on two sides by large lakes – Lough Gowna in the northeast and Lough Ree along the Shannon River, which forms Longford’s western border. Co. Longford is generally a quiet place, and with so many bodies of water, it is a great spot to engage in a little aquatic relaxation, such as fishing and boating. If you’ve a bit of a bent for danger, canoeing or kayaking the intense white water rapids on the River Inny in Ballymahon will certainly get your heart pumping, as they are among the biggest and most exciting rapids in Ireland. 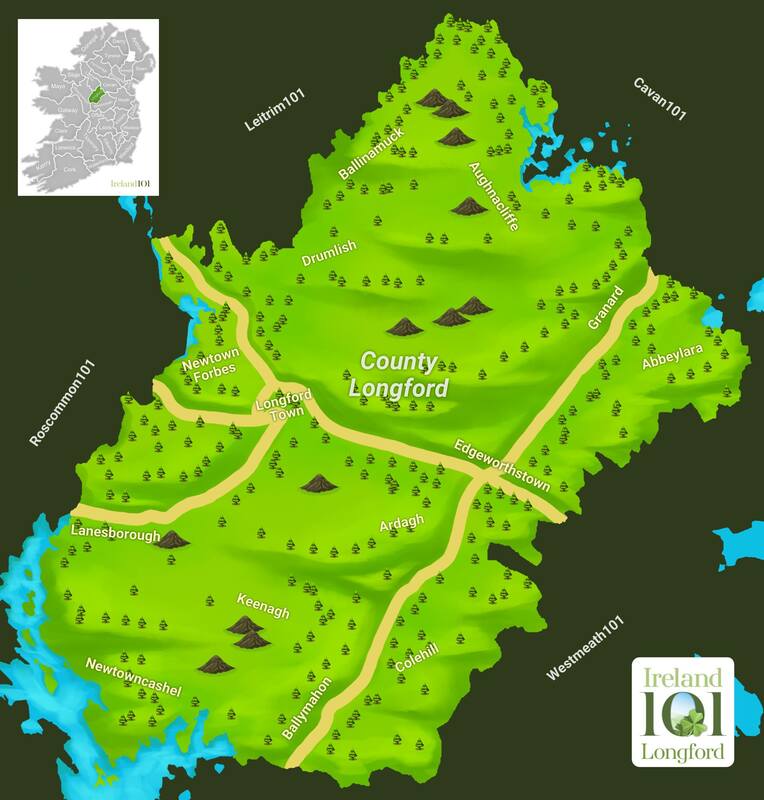 Early in its history, Longford was a place for the gentry and monks, a fact that explains the incredible number of monasteries within its boundaries, including Abbeylara, Abbeyshrule, Abbeyderg and Saint’s Island, most of which have well-preserved remains open to visitors. 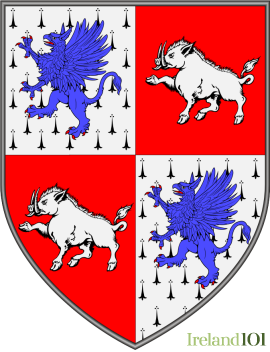 Officially shired in 1586, Longford also saw its share of wars, overseeing the defeat of French forces during the 1798 Rebellion (an exhibition in Ballinamuck tells the story), and contributing the North Longford flying column, led by Seán Mac Eoin, to the Irish War of Independence. Longford also produced beloved poet Oliver Goldsmith and famous actors like Mel Gibson, whose mother was from Ardagh, but none of these can overtake Longford’s biggest claim to fame: an Iron Age bog road that dates back to 148 B.C. Parts of the wooden structure are preserved at Corlea Trackway Visitors Centre in Kenagh. 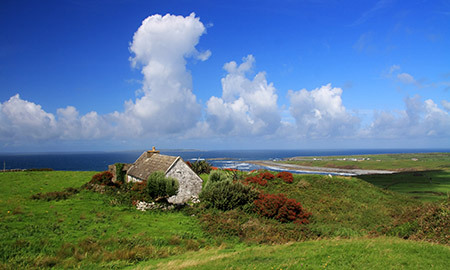 For one of the best views in Ireland, hike up to the motte in the little known town of Granard in the north part of the county. From here, at 543 feet up, you will be able to see nine Irish counties, five lakes and a handful of forests and rivers, including the Shannon, Erne and Inny. This unsuspecting little town also birthed Kitty Kiernan, fiancée of Michael Collins, and claims that both St. Patrick and evil Queen Maeve spent time here. 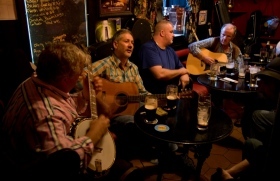 The Johnny Keenan Banjo Festival is an annual celebration of Irish Traditional and American Bluegrass Music which takes place in Longford. 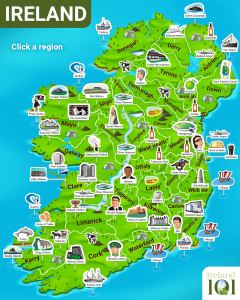 How much do you know about Longford ?